#StreetsAndBeats: How Do Cops And Communities Build Trust? Michel Martin hosts a live storytelling event around police and community relations in Los Angeles. Join the online conversation by using #StreetsAndBeats. 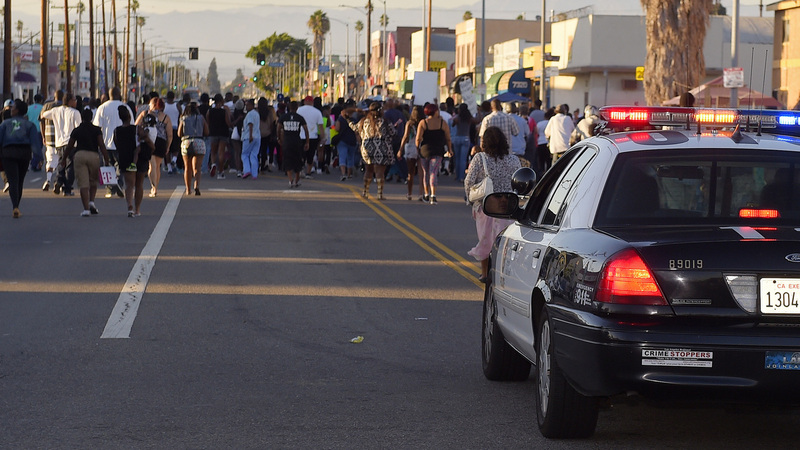 #StreetsAndBeats: How Do Cops And Communities Build Trust? A Los Angeles Police Department car follows protesters as they march near the city's 77th Street police station last August. It was a protest of the fatal LAPD shooting of Ezell Ford. Their lives and deaths are now a part of the public record, their names part of a tragic roll call: Rodney King, Michael Brown, Ezell Ford, Eric Garner, Walter Scott, Freddie Gray, Rekia Boyd and Tanisha Anderson. They are just some of the Americans who've been killed or harmed in encounters with police. But does it have to be that way? How do we get beyond violence and deep-seated animosities in a relationship where conflict is a part of the job? Today, in collaboration with KPCC, I will be at the Los Angeles Theatre Center for a unique evening of storytelling about policing and community. What do you think might improve public safety and relationships between those charged with enforcing the law and the people they are sworn to serve? Join the online conversation by using #StreetsAndBeats. Editor's Note: Some of the language during these performances may offend some listeners. NPR's Davar Ardalan will moderate the chat and NPR's Frederica Boswell will tweet from the live event using @NPRMichel. *If you are listening to the live-stream or taking part in the Twitter and Facebook chats, please take a moment to tell us your experience. We learn from you, and your feedback is important to us.